Happy Star Wars Day—or May the Fourth! Did you know that hospitals waste about 30% of health spending ($750 billion!) on unnecessary care each year? It takes a real Jedi to solve that problem! With UbiCare's SmarteXp 3.0.1, you will meet Meaningful Use requirements, manage population health and make meaningful connections with patients through APIs. 1. 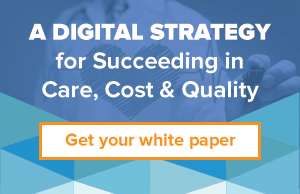 Get the tools you need to easily meet Meaningful Use (MU) Stage 2 and 3 requirements. New and evolving regulations and priorities present real challenges for hospitals, so we have structured solutions to meet your needs. As of November 2014, fewer than 17 percent of hospitals had demonstrated MU Stage 2 requirements, according to the latest CMS data. As of Sept. 30, fewer than 38 percent of eligible hospitals (EHs) and critical access hospitals (CAHs) had met either MU stage in 2014. If your hospital is among them, UbiCare’s SmarteXp can help you. 2. Focus on population health management. MU and population health, along with new care models such as Accountable Care Organizations and Partnership for Patients, strive to improve the quality, access and cost of care—the Triple Aim. These models give you the force of patient/provider communication, coordinated care throughout the care continuum and patient engagement. They are starting to show financial and quality improvements—but they are not simple to implement. UbiCare's SmarteXp makes it easy and efficient to improve population health. 3. Help your systems speak to each other with APIs. Our newest features are designed specifically to help hospitals efficiently meet the challenges of using certified EHR technology meaningfully and promoting preventative care and access to that care—effectively helping patients to be healthy. With UbiCare's SmarteXp, hospitals are able to connect and engage patients digitally, prove the good forces in health and champion the future of healthcare. Plus, with the use of our enhanced API and HL7 compatibility, connections will be easy, efficient and light-years ahead. Connecting, engaging and proving that engagement is working—these are the keys to managing population health and using EHRs in a meaningful way. 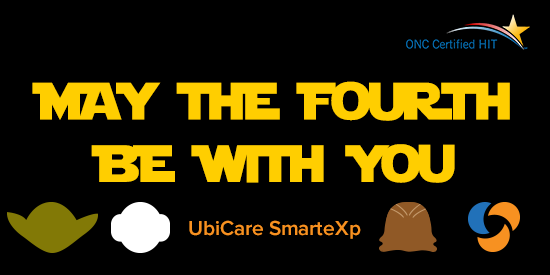 When is comes to making patient engagement more effective and cost efficient, May the Fourth Be With You! Disclaimer: UbiCare SmarteXp 3.0.1 is an ONC Certified Modular EHR for Patient Specific Education Resources for Ambulatory and Inpatient Settings — Meaningful Use 2014 Edition. 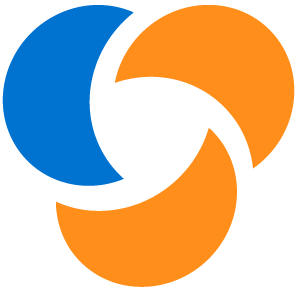 UbiCare SmarteXp 3.0.1​ was certified under the vendor name TPR Media LLC (dba UbiCare) on December 23, 2014 by InfoGard. CMS EHR Certification IDs: IG-3230-14-0081 and IG-3230-14-0107. Certification Criteria: 170.314(a)(15), (g)(1), (g)(4). View the EHR test reports (ambulatory | inpatient). This EHR Module is 2014 Edition compliant and has been certified by an ONC-ACB in accordance with the applicable certification criteria adopted by the Secretary of Health and Human Services. This certification does not represent an endorsement by the U.S. Department of Health and Human Services or guarantee the receipt of incentive payments.